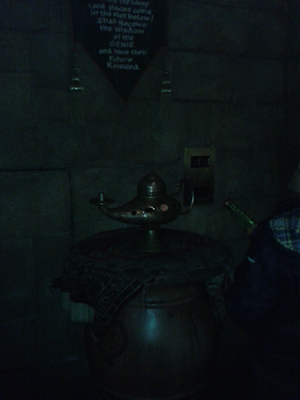 So back in the day, I posted about the stores in Adventureland, and one of the unknown (to me) things I saw back there was a genie’s lamp. However, I went recently and guess what was back IN order? 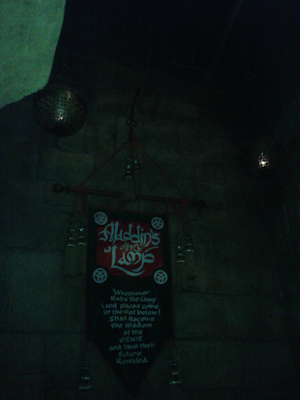 Yeah, Aladdin had to go into the Cave of Whatever It’s Called But It Will Kill You If You’re Not The Diamond In The Rough Or Something, but you my friends, YOU, can find it right there in Adventureland. Needless to say, I had to stick in my 50 cents. And really? 50 cents? But whatever. 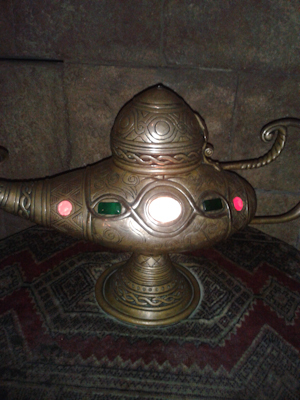 I had hoped the lamp would spit out some kind of fortune card or something, but it did not. Instead, it lit up and flashed a lot. And the genie, who was decidedly not Robin Williams, spoke to me. Out loud, not just in my head. The genie predicted that, among other things, I would become fabulously wealthy and I might want to seriously consider buying lottery tickets (done and DONE!). It also predicted that I would win the Superbowl as a starring athlete. So look for me on the field y’all. Look HARD. Okay, it didn’t say the Superbowl, but it was strongly implied. All in all, did I feel like I got my 50 cents’ worth? Sure, why not? It’s Disneyland! Pretty sure that’s my new favorite quote.